Imagine my delight when, upon leaving my office building one fine afternoon in Dubai, I found THIS, right on my doorstep. It’s one of my favourite moments to recall when remembering the city that was built quite literally around me. Fabulous! Luckily I had my camera on me, so before the hour was out, everyone in my entire friendship circle was able to enjoy this unfortunate accident along with me. It’s a shame I didn’t have a video function at the time, too, because then I would’ve been able to share the looks of absolute misery on the poor construction worker’s faces as they skidded about under the wrath of their furious manager: “WHY IS OUR CRANE IN A HOLE, YOU IDIOTS!!! !” (in Arabic). 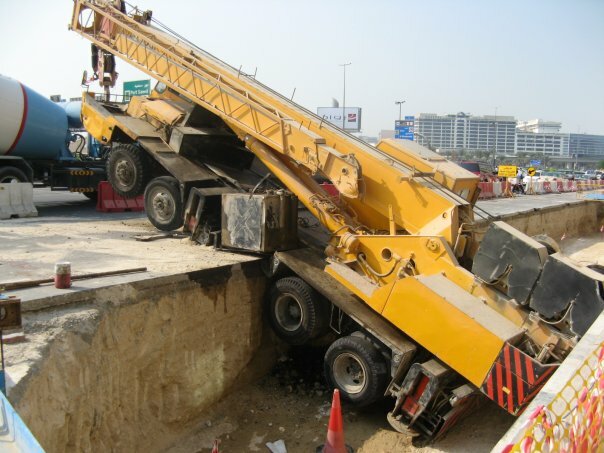 Eventually the crane was lifted out of the hole by another crane – which was nice. Lucky there are so many of them around.